Longhair Brazilian Cowhides (hanging) and Tito Agnoli Modular Sectional at Katie Koch Home; Vintage Wool Throw Blanket at Sunday Shop; Shearling ‘Brady’ Counter Stool at Eclectic Home. 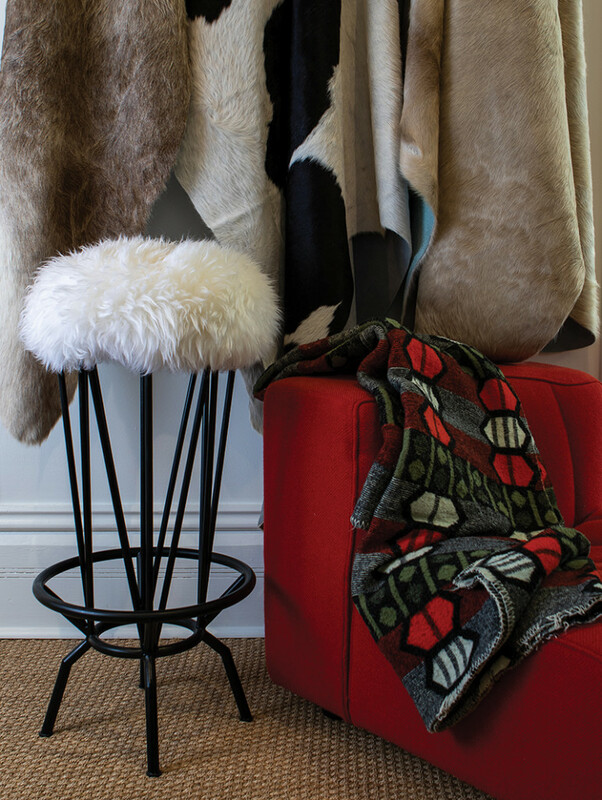 Bloom & Give Cotton and Wool Jacquard Throw at Sotre; Velvet-backed Kilim Pillows at Sunday Shop; Moroccan Rug and Square Pouf at Katie Koch Home. Clockwise from top: Furry Fanny Pack, Furry Round Wristlet, and Carpetbag Tote at Katie Koch Home; Polar Camel Coat at Peony. African Block-print Textiles and Black Shearling Stool at Eclectic Home; Straw Medallions and Small Clay Mantis Bowl at Katie Koch Home. Embroidered Pillows at Katie Koch Home; Vintage Striped Boujaad Rug at Sunday Shop.